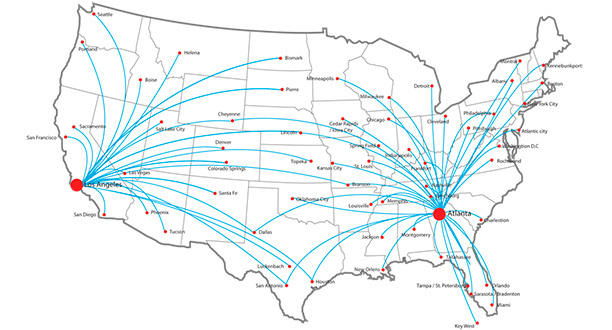 Clipper currently services numerous national and international customers with hundreds, even thousands, of ship-to destinations. Because we supply a variety of uniforms to our customers around the globe, our personnel are thoroughly versed in the procedures of domestic and international shipping. Along with our U.S. Distribution facilities, we also offer factory direct distribution to over 200 countries. Many of our Customers have special requirements for labeling, packaging and other preparation for shipment. Our flexible processes allow us to accommodate virtually any special packaging request. Our extensive customer base dictates that we have the ability to fulfill very diverse shipping requirements. We can provide logistical solutions for any type of business. Whether it's 5 or 5,000 locations, direct to store or distribution center, in the U.S. or around the world, with Clipper you will receive your uniforms when, where and how you want them. We make a promise. We keep it. It's that simple.